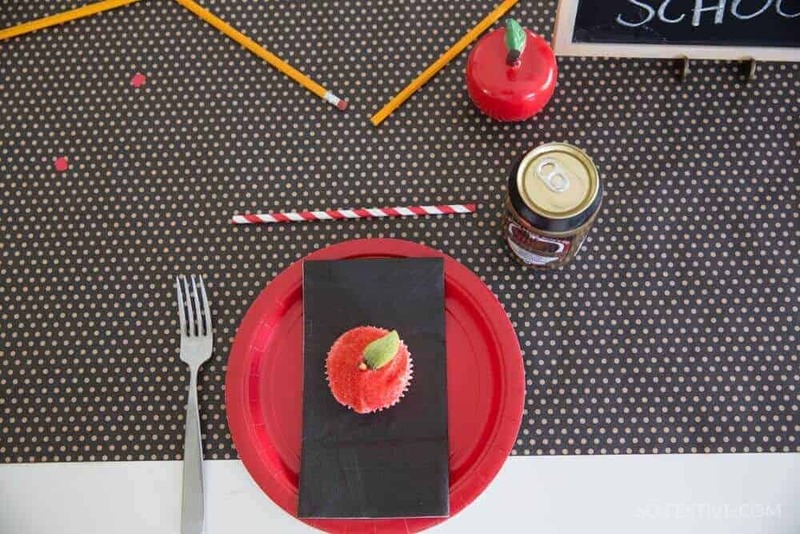 Apple Cupcakes You Can Make Easily- Back to School Ideas - So Festive! 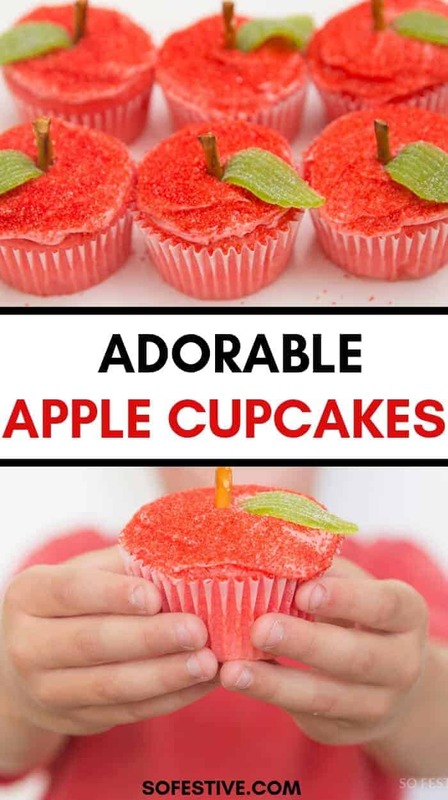 Adorable Apple cupcakes you can make for Back to School, Fall, or as a teacher gift! It’s Back to School time and that means…. school shopping dates, back to school dinner, and apples. Right? Don’t apples just scream back to school time? I sure think so! 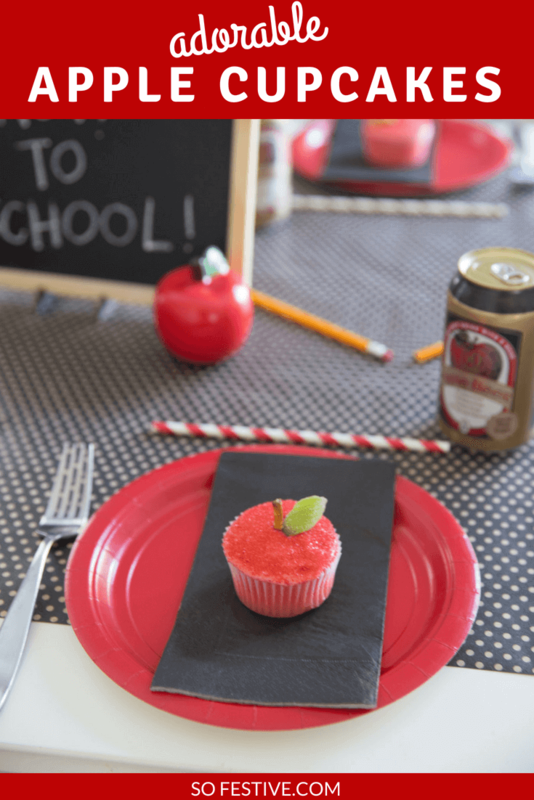 Whether you’re hosting your own family back to school feast, back to school party, or just want a festive treat for this season, these apple cupcakes are so adorable and EASY to make! In fact, even your kids can help…unless you want to keep them a surprise. These apple cupcakes are just too cute and fairly quick to make. But if you don’t have time to make these for your back to school dinner, you might like The Easiest Back to School Cupcakes . I wasn’t going for gourmet cupcakes here, so I just used a boxed cake mix. Choose a white or vanilla cake mix that can easily be colored red, or use a red velvet cake mix. I used vanilla and added red food coloring to make the batter red. By dyeing the batter, you’ll have nice, red cupcakes all around that can be seen through the cupcake liner. I keep a stash of these white cupcake liners at all times that I use for all cupcakes and muffins. They are cheap and they last me forever. There is nothing worse than not having cupcake liners when you need them! Once your batter is red, divide into muffin tins, lined with white cupcake liners. Now bake according to the package directions. Frost the cupcakes with the red frosting. Before the frosting dries, sprinkle the red sugar crystal sprinkles on top. Then stick a pretzel in the middle for the apple stem. Finally, you’ll want to add the green leaf. To make, simple cut an oval shape out of the green strip candy. Stick firmly into the cupcake next to the stem. And now you’ve got adorable apple cupcakes! You can make the cupcakes ahead of time and freeze them, but I’d recommend frosting and decorating the day of your party. 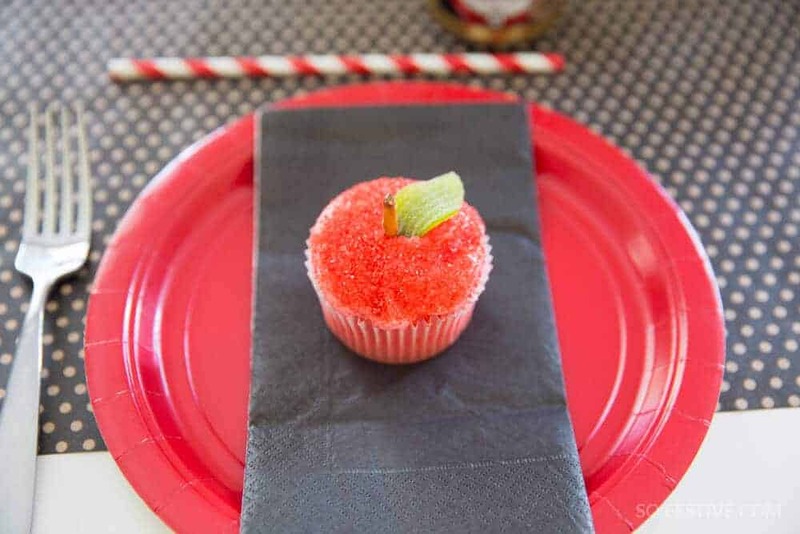 Tip: These apple cupcakes are so darn cute, that you should have them sitting out before guests arrive. They make a great place setting addition. I’d love to see your apple cupcakes! If you make them, tag @sofestive on Instagram to be featured!